another stupid launch by the local morons....honestly whoever is responsible for the Strategy/Marketing of toyota.....should eat their brains and then puke to death! 1.35 crores for a freakin Prado??? I would rather buy a used Range/x5 and then buy a used E class/5 series...within the same amount....and will go home laughing! and 2.5 mil for a 1.5 terios ?? muhahah speechless! Suzuki are not far behind with their swift launch....I mean they launch the cars 5 years too late...and then ask for a million...then its above 1300cc i am told....so it will have the tax of 1500 and wont qualify for govt cars under or equal to 1300 cc.... smashing! There goes my dream of ever being able to afford a decent and brand new SUV in Pakistan. Our currency depreciation and economy is going to eliminate the middle class altogether. People will either be filthy rich or poor. i gave up that dream a long time ago. you're much better off buying a slightly used SUV in PK as it's more cost effective. sadly at the moment the used car market is also over inflated and people are asking silly money for their SUVs. just pray the duties go down to where they were 2 years ago (at least). then we'll have alot to choose from. Infact Toyota Camy has been renamed as Toyota Rush in 2006. whose engine has been upgraded to 1.5 VVTi provided by Daihatsu. Daihatsu Terios is maintaining its name as before, it has also recieved engine upgrade to 1.5VVTi. Similarly Toyota Passo with 1.0 litre engine is identical twin of Daihatsu Boon. As a matter of fact Vitz's popular engine has been made by Daihatsu. i think toyota has listed out the smugglers to sell these cars to ! , any1 with halal money cannot buy these ! we r already paying more 4 craps like alto , cultus , corolla , city etc . 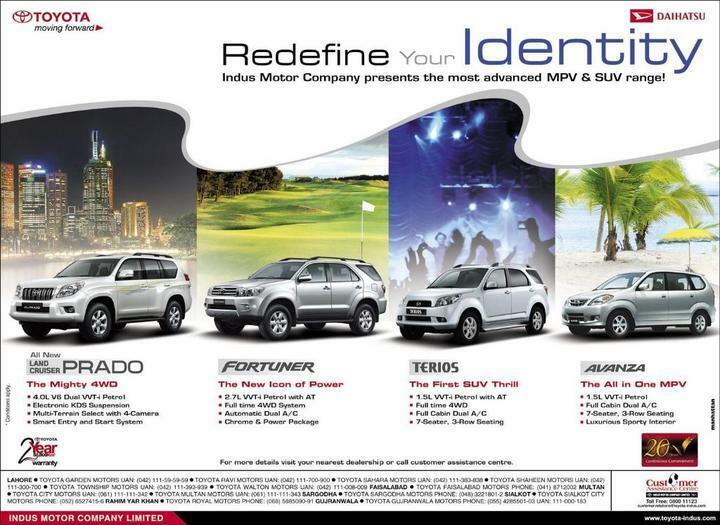 terrios and avanza are priced well..!! one more thing, Avanza has airbags, APV doesnt. btw 6 million for cammry,,i would rather go for 2-3 year old 7 series..
yes, untill you actually see the size of it. it's smaller than a sportage!